Compliance Forge, LLC, a leading provider of premium B2B cybersecurity documentation, announces the availability of the Cybersecurity Standardized Operating Procedures (CSOP) that leverages the NIST NICE Cybersecurity Workforce Framework for roles and responsibilities. ComplianceForge is once again leading the cybersecurity documentation industry with its B2B product line - the Cybersecurity Standardized Operating Procedures (CSOP) is currently the only enterprise-class, customizable template for cybersecurity and privacy procedures on the market. ComplianceForge [ComplianceForge __title__ https://www.complianceforge.com is once again leading the cybersecurity documentation industry with its B2B product line - the Cybersecurity Standardized Operating Procedures (CSOP) is currently the only enterprise-class, customizable template for cybersecurity and privacy procedures on the market. The CSOP addresses a key component for most statutory and regulatory compliance obligations, since there is an undeniable expectation for companies to demonstrate evidence of procedures to support an effective, risk-based information security program to protect Controlled Unclassified Information (CUI). At the heart of it, the CSOP provides an organization with clear cybersecurity procedures that can scale to meet the needs and complexity of any team. 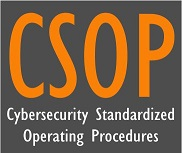 The CSOP’s procedures are mapped to leading frameworks, so it is straightforward to have procedures that directly link to requirements, such as ISO 27002, NIST 800-53, NIST 800-171, NIST Cybersecurity Framework and many more. The value of the CSOP comes from having well-constructed procedure statements that can help an organization become audit ready in a fraction of the time and cost to do for organizations to do it themselves or hire a consultant to come on-site and write it for them. The entire concept of this cybersecurity procedures template is focused on two things: (1) Providing written procedures to walk team members through the steps they need to meet a requirement to keep an organization secure; and (2) Help the company be audit ready with the appropriate level of due diligence evidence that allows it to demonstrate compliance obligations are met. Given the difficult nature of writing templated procedure statements, the CSOP is approximately a "80% solution" since it is impossible to write a 100% complete cookie cutter procedure statement that can be equally applied across multiple organizations. What this means is ComplianceForge did the heavy lifting and its customers just needs to fine-tune the procedures with the specifics that only the customer would know to make it applicable to their organization. Leveraging the NIST NICE Cybersecurity Workforce Framework, the procedures identify the roles that would be responsible for the procedure being executed, including stakeholders who influence the execution of the procedures. For many companies, this is at the very least a huge step forward in identifying the proper individuals or teams to assign responsibilities for procedures. ComplianceForge is a business accelerator - the focus is to provide solutions that reduce the time for businesses to meet their cybersecurity needs. The B2B cybersecurity documentation is a fraction of the cost as compared to hiring a consultant to custom-develop documentation and are generally delivered within one business day. The CSOP template available for purchase online. For those interested in learning more, they can see an example here.